Kids will first be socialized to feel comfortable and part of the group, focusing on mat awareness, they will learn and develop balance, coordination, agility, respect, discipline, good behavior and sportsmanship, learn the rules and basic techniques. At the next step kids will start light sessions of training to be familiar with contact with a partner and gradually start to train with bigger training partners to lose the fear and start to get self-confidence. 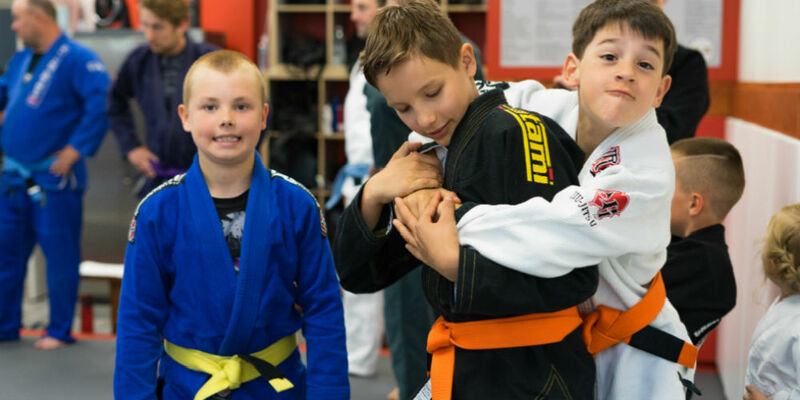 Jiu-Jitsu is much more than just self defense and when your child trains with us, you’ll be giving him or her the extra advantage in all areas of life. Learning authentic Brazilian Jiu-Jitsu in its purest form will bring out the best in your child. Starting with fundamentals of self-respect, our program instills valuable life skills and knowledge to help them be better at home and school. Our classes are filled with the right amount of fun and discipline to make sure they stay focused and enthused to come back again and again. As the children continue to improve in their training, there are some common and natural side effects. They develop exceptional self-control, which helps them to handle their emotions more effectively. Their self-confidence gets elevated as they feel more safe and secure in their ability to defend themselves if they were attacked. Control and confidence will develop an inner calmness in the midst of chaotic or scary situations, they will think faster and respond with more appropriate actions. As their peers notice these character traits, they will look up to your child as a positive role model and even a leader. We like to say that the Brazilian Jiu-Jitsu lessons will help your child to be a “Champion In Life!”. Your child will be exposed to new character building lesson every month and the instructors will also look for how these traits are demonstrated while in our school. Every Parent Wants To Be Confident That Their Child Will Be Able To Handle School Yard Bullies! Understanding the psychology of a bully is a big step towards preventing your child from being approached by them. Our Bully Guard program in integrated into the regular kids training schedule and helps to prepare them for any possible scenario. IF engaged by a bully, your child will remain confident and always start with techniques that diffuse the situation. When all effort to stop the bully from physical attacks don’t work, your child will be able to safely and effectively defend themselves. Many times the lessons they learn on how to deal with bullies are so effective that they can even turn that bully into a friend and stop any further bullying. Designed for all the beginner students to learn and focus on basics, postures, grips, hip movement, defensive positions, offensive positions through pedological progression of Marcus Soares BJJ curriculum of 150 basic techniques. The students after completing the basic curriculum will start to learn how put the basic techniques together using concepts and strategies of BJJ to ensure a successful outcome in any situation and include sparring for tournaments or real-life self defense.